Organic celeriac. 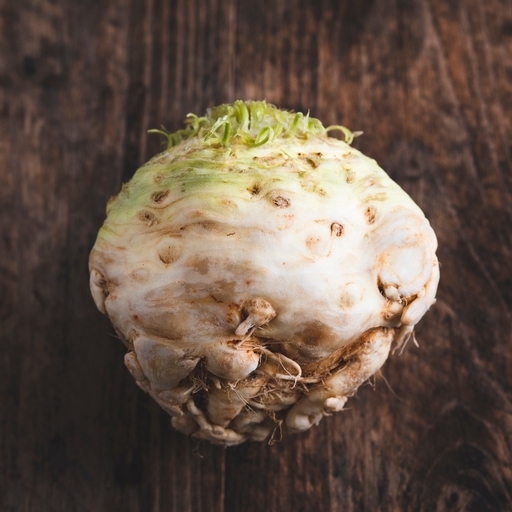 This knobbly, ugly duckling of a root veg is a wonder in the winter kitchen. Under the craggy skin lies a smoky, earthy fragrance that can be the starting point for hundreds of recipes: a classic crunchy rémoulade or salad, a sweet, velvety mash, a warming gratin or a silky soup. Celeriac is good friends with the other winter roots. Pair with potatoes in mash, roast in a tray with carrots and parsnips, or add in chunks to a hearty stew or pie with whatever other roots you have in your box. Keep cool and damp in an outdoor veg rack or the bottom of your fridge. It should last for several weeks. Look out for celeriac from October through to February.